Shipments to the US will be sent from our fulfillment centre in Texas. Shipments to the UK and the rest of the world are sent from our UK office. If you have chosen expedited shipping (First class, Fedex, Special Delivery, Airmail) etc your shipment will normally be sent either the same working day or the next day. Standard (free shipping) will be sent within 5-7 working days. Due to the additional cost of airmail shipping, customers outside the UK and the USA do pay a small fee for shipping. This will be made clear at the checkout and is usually about £5.99. Only Fedex, Special Delivery or Tracked Airmail shipping options offer tracking. We do not provide this tracking information on our website, however you may email us with the order number to receive tracking information if you have selected one of those shipping methods. Our online ordering system is automated so once a product is ordered it will be within an automated delivery system. Whilst we cannot guarantee to be able to honour a cancellation, we will attempt to do so as long as the request is made by email before 5pm GMT on the day of ordering. If goods have already been shipped and the customer still wishes to cancel, the customer will need to return the goods to the Musicademy office in the UK (address below) at their own expense. In the UK most items will be delivered by Royal Mail. Our standard free shipping option is for second class Royal Mail. Items will be shipped within 3-5 working days of Musicademy receving your order. Should you pay to upgrade to First class, the shipment will be made within 1-2 days of Musicademy receiving your order. The next day Special Delivery service does not guarantee a Saturday delivery. Whilst we will do our best to ship items on the same day that Next Day Delivery is selected, it may be 1 working day before the shipment leaves the Musicademy office. In the US most items will be delivered by USPS. Larger orders may be upgraded to Fedex. We advise you to select Fedex if you require your item to be tracked and insured. Orders outside the UK and USA will be shipped by Air Mail. You can select an upgraded service at the checkout whereby your items are tracked and insured. We reserve the right to substitute delivery methods where we deem appropriate. Customers outside the UK and USA may find that their packages are subject to customs duties. It is the customer's responsibility to pay these duties. Delivery charges are made clear at the checkout stage of purchasing. Musicademy offers a free shipping option to customers in the USA and the UK, however you are offered the choice to upgrade to a faster or tracked/insured method at a higher price. Customers outside the UK and USA do pay a small fee for shipping. This will be made clear at the checkout and is usually about £5.99. In order to process your order and deliver your purchases to you we may have to pass your information to some of our service providers. This includes the companies who handle our order despatch service and our delivery companies. Some of these companies may be outside of the European Economic Area in jurisdictions which do not provide the same level of data protection as the UK. When you select your shipping method you will have a choice. Free shipping (UK and USA only) items are shipped within 5-7 days of ordering. You can upgrade to first class shipped 24-48 hours Monday to Friday if you prefer. Courier and special delivery items are normally shipped within 24-48 hours. For orders sent from our UK office, Musicademy Ltd obtains a proof of posting for each item shipped. If the postal service then fails, customers may be asked to wait a few more days before obtaining a replacement and may also be asked to assist Musicademy with a Royal Mail compensation claim. If tracking and insurance are important to you please select either Fedex, Courier or Special Delivery services. Returns in pristine condition will be refunded if our terms and conditions have been adhered to. Shipping costs are non refundable. If you have any queries then please do not hesitate to contact us. 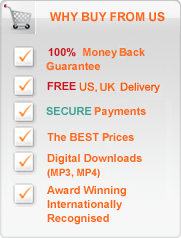 For CDs and DVDs we offer a money back guarantee if you are less than satisfied with the product. To qualify for this you will need to return the item in pristine condition. All returns requests must be made in writing or by email, quoting your order reference number, within 7 working days starting the day after you receive your order together with an explanation of why you are returning it. Consumable products such as throat sprays may not be returned due to the ease with which they can be tampered with. Refunds are not available for downloadable products. It is your responsiblity to back-up any downloads. We are not able to replace downloads lost due to computer hard drive failure. You must first contact Musicademy at [email protected] to make arrangements for returning your item. These are the terms and conditions which apply to your purchase of items from the Musicademy web site at www.musicademy.com ("the website"). The website and goods are provided by Musicademy Records Limited and Musicademy Limited, companies registered in England under number 5597213 and 5084217 with a registered office at Oak Tree House, Berry Lane, Chorleywood, Herts WD3 5EY UK ("we", "us", "our"). When we refer to "you" and "your" we mean the user of the website and purchaser of goods. Downloads are non refundable. In the unlikely event of a downloadable product failing to operate as advertised we will work with you to get it working. You will not be eligible for a refund if you do not cooperate with requests from our technical support. You will also not be eligible for a refund if we conclude that the problem is due to problems local to your computer or device. We must receive full payment of the price of the goods before we can accept any offers. Where you select to pay by credit or debit card we will process the payment at the time of preparing your goods for despatch. Purchases made by Paypal may take longer to clear. Goods are not shipped until payment is received by Musicademy. All prices and charges on the website are in UK Pounds Sterling or, in the case of customers based in North America, US Dollars. The currency you are offered will depend on the IP address of your computer. If you are in North America and are offered prices in Pounds Sterling, it will be because your IP address appears to our website systems not to be in North America. If this happens we suggest you contact us to arrange a telephone order. Orders to territories outside North America paid in US Dollars will not be accepted. Instead if you pay by Paypal, then Paypal does not charge an additional fee to you. Musicademy Ltd and Musicademy Records Ltd are not VAT registered therefore items are not subject to VAT. All CDs and DVDs sold on this site are for individual use only. It is illegal to copy them, loan them out (even in a non commercial setting) or to use them in a group teaching situation. If you would like to use the them for anything other than your own individual tuition (for instance as warm up exercises for a choir), then please purchase a license from Musicademy. Email [email protected] for more information. It is also illegal to make copies of any of the downloadable products or transfer them to a computer owned by anyone other than the original purchaser. Please make sure that you back up any downloads you have purchased. Musicademy cannot be liable to computer hard drive failure or any other loss to your download after having purchased it. If you require Musicademy to replace a downloadble file, an admin charge will apply.